In the year 390 the populace of Thessalonica rose up in revolt against the local Roman authorities to protest the arrest of a popular charioteer. 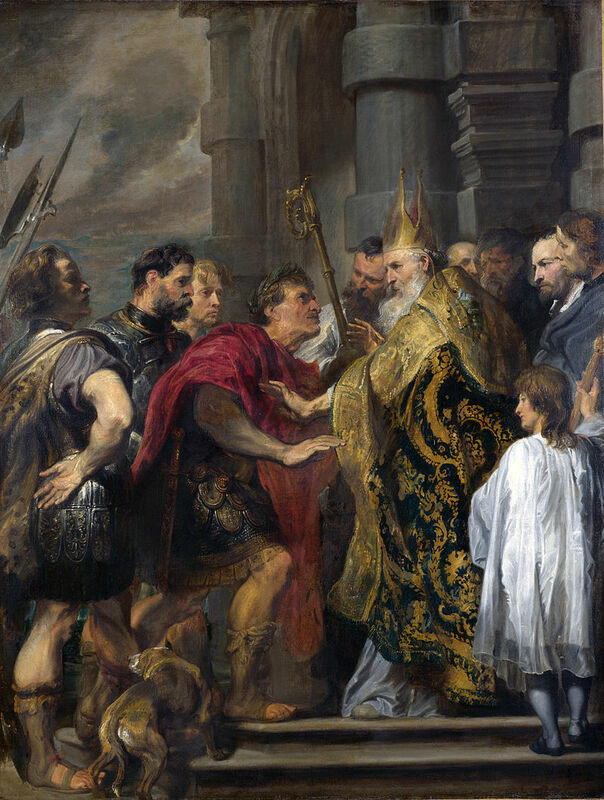 The Roman emperor Theodosius, known for his thin skin and quick temper, was swift to respond. He sent a letter ordering troops to punish the inhabitants, which they did by means of a terrible ruse. They invited the whole town to attend a special sporting event. Once the stadium was packed, the soldiers locked the exits and slaughtered the entire crowd. The notoriously erratic Theodosius, meanwhile, had cooled off and changed his mind, sending another letter to contradict his original order, but it was too late. Seven thousand Thessalonicans were already dead. Sadly, there will be no bishop to bar the Father of Lies and his minions from the National Cathedral in Washington this Saturday. The inaugural prayer service, a tradition since FDR’s inauguration in 1933, will go on as usual despite fierce protests from the many Episcopalians who regard such normalization of the president-elect to be at best a foolish mistake and at worst a desecration of sacred space. The diocesan bishop, Mariann Budde, has cited two “spiritual principles” to justify the cathedral’s decision. The first is inclusiveness: Episcopal churches, she says, “welcome all people into our house of prayer.” She is aware that Trump is not a model citizen. “Welcoming does not mean condoning offensive speech or behavior; it does not mean we agree with or seek to legitimize.” But I think she fails to acknowledge the critical difference between opening our doors to notorious sinners and letting them dictate the content and flavor of our worship. Bishop Budde’s second principle is that “in times of national division, the Episcopal Church is called to be a place where those who disagree can gather for prayer and learning and to work for the good of all.” This reflects the noble Anglican ideal of church as family. We may not always agree or get along, but we don’t stop gathering or trying to love each other anyway. We recognize truth not as the fixed possession of a single faction, but the product of a dialectic exchange, where we each contribute our incomplete perspectives to a process of mutual listening and collective discernment. This process is ongoing and never finished. But a commitment to communal harmony has its price. At the time of the Civil War, the Episcopal Church maintained its structural unity by declining to make an official condemnation of slavery. As a result, it was spared the North-South splits of other denominations. While many individual preachers, parishes and dioceses spoke out against slavery, the church at a national level remained silent on the gravest moral crisis of the 19th century, lest they endanger the principle of welcoming all people. The Bishop of Washington hopes that the inaugural prayer service will, at a time of intense national conflict, “offer a few moments of spiritual solace and the healing gift of transcendent beauty.” As a priest, liturgist and artist, I am a great believer in the value and necessity of providing sacred space and time, where sin and strife are hushed and we may encounter the world of God, not only in our minds and hearts but also with our senses. However, that should not mean losing touch with the imperatives of justice and love. Worship isn’t just to soothe and bless. It must also challenge, unsettle and transform. As I understand it, the inaugural service will do none of these things. Preaching (always a risk) has been forbidden by Trump’s people, who are tightly controlling the whole order of “worship.” Judging from everything the president-elect has said and done over the years, we may expect no prayers of repentance for racism, misogyny, or xenophobia, or petitions that God may frustrate the designs of evil tyrants. Trump is no more submitting to the norms of Christian worship than he is to the norms of our democracy. He is essentially renting the spectacular Gothic edifice to bathe his authoritarian persona in a faux-religious glow. To allow such a charade threatens the integrity of the cathedral’s essential mission while abetting the fascist tendencies of Trumpworld. All glory be to the Leader. At least one member of the Mormon Tabernacle Choir has bravely refused to sing at the inauguration. “It would be like throwing roses to Hitler,” she says. The National Cathedral choir, however, has agreed to participate. As the cathedral dean explains, “We do not pray or sing to bless a political ideology or partisan agenda…We sing to honor the nation.” But is it really the church’s business to honor the nation? Despite our roots in the Church of England, the Episcopal Church is not a state church. It is time to shed all pretensions of being an indispensable cornerstone of civil religion. Our job is not to bless the status quo or national interests, but to proclaim and embody the gospel. Instead of praying for the president as if the soon-to-be-degraded office earns him any special attention, let us pray for everyone in the world who wields power, that they may do no harm and nurture the common good. Let us pray not just for the leaders of the nations and economies of the world, but for the prophets who speak to power and the activists who work for change. Less elitism, more democracy in our prayer life. Less nationalism, more globalism as well. Such an expanded range of attention retains the Anglican commitment to engage public affairs rather than flee them, while rejecting the fiction of American exceptionalism. Concurrent with the controversy over the inaugural prayer service is a lively debate over prayers for the president at any public worship. Are we praying for the man, the office, or good governance? For those of us who may be his victims, are we praying for an enemy? If so, what is the aim of such prayer? And if we mention him by name, do we risk polluting worship with a rush of negative associations? All this bears close consideration, but it is not really pertinent to the question of whether the National Cathedral should host the inaugural prayer service, to which the answer should be an unequivocal no. It is one thing to pray for our enemies. It is quite another to let them dictate what happens within our sacred spaces. Bishop Ambrose regrets that he cannot attend on Saturday. Is there anyone who will take his place at the cathedral door? This entry was posted in American presidency, Anglican spirituality, Authoritarianism, Christianity, Donald Trump, Election 2016, Episcopal Church, Inaugural prayer service, Liturgy, Politics and religion, Religion, Uncategorized, Worship and tagged Ambrose and Theodosius, Bishop Mariann Budde, Controversy over inaugural prayer service, Episcopal Church and civil religion, Episcopal Church and the Civil War, Inaugural prayer service 2017, Should the Episcopal Church allow Trump to hold a prayer service in the National Cathedral?, Should we pray for the president?, Speaking truth to power, The Sacred Harp "Thy foes profanely rage", Trump fascist tendencies, Washington National Cathedral by jimfriedrich. Bookmark the permalink. Is there anything we can do? To whom should we send our protests? A “prayer service” controlled by politicians is not a prayer service. thank you, thank you for your reasoned statement. I sympathize with the author but I am stuck on Matt. 5: 43-49. 43“You have heard that it was said, ‘YOU SHALL LOVE YOUR NEIGHBOR and hate your enemy.’ 44“But I say to you, love your enemies and pray for those who persecute you, 45so that you may be sons of your Father who is in heaven; for He causes His sun to rise on the evil and the good, and sends rain on the righteous and the unrighteous. 46“For if you love those who love you, what reward do you have? Do not even the tax collectors do the same? 47“If you greet only your brothers, what more are you doing than others? Do not even the Gentiles do the same? 48“Therefore you are to be perfect, as your heavenly Father is perfect. Perhaps I can find a good prayer for this one I perceive to be not just my enemy but the enemy of all that is decent. I have to say I am shocked that the Dean would allow the service content to be dictated by the Trumpists. I know the cathedral is having financial difficulties but this does seem perilously close to prostitution.